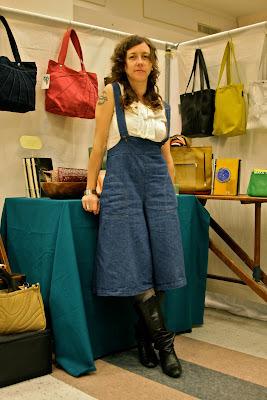 Michele Kline of bag and accessory line SNAP Design at Urban Craft Uprising. This line of lovelies is handmade in Portland by Michele herself! You can find her pieces all over the country and locally here in Seattle at Velouira (now open on Capitol Hill!!) and Lemon Meringue, and The Paper Doll in Bellingham. I found Michele's outfit to be so wonderful when I came across the Snap Design booth at UCU. Such fantastic pants!